Directed by Markus Goller. 2017. Germany. 113 min. German with English subtitles. Hawaiʻi Premiere. 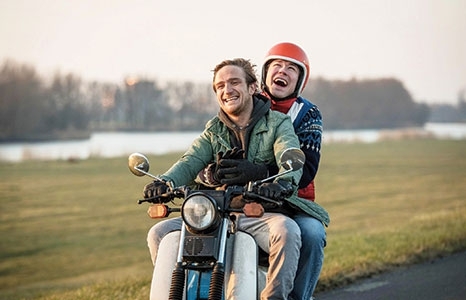 Based on the novel by world-famous French writer Marie-Aude Murail, this touching and entertaining buddy road trip movie stars two of Germany's most talented young actors: David Kross (The Reader, Tough Enough) and Frederick Lau (Victoria, The Wave). This touching and entertaining film is directed by Markus Goller, whose Friendship! was the most successful German film at the box office in 2010. Ben (Frederick Lau) and his brother Barnabas (David Kross) have been very close ever since Ben can remember. Barnabas, also known as "Simpel", is 22, but has the mental capacity of a 3-year-old. Even though Simpel can be really irritating, life without him is absolutely unimaginable for Ben. When their mother dies unexpectedly, the authorities want to put Simpel in a home. To escape this fate, the brothers flee, setting out on a crazy odyssey across North Germany until they reach Hamburg and where Ben realizes he has to find their father David (Devid Striesow). Highly emotional and at the same time very funny, My Brother Simple portrays an unusual pair of brothers whom nothing can separate. Winner—Youth 4 German Cinema Award, 2018 Berlin & Beyond Film Festival.